Aston is an original shell replacement for Windows - you can use it as a whole and customize every desktop element the way you like. This surprisingly smart, considered, at once sophisticated and simple shell replaces the standard Windows desktop and makes it more usable, beautiful and customizable. 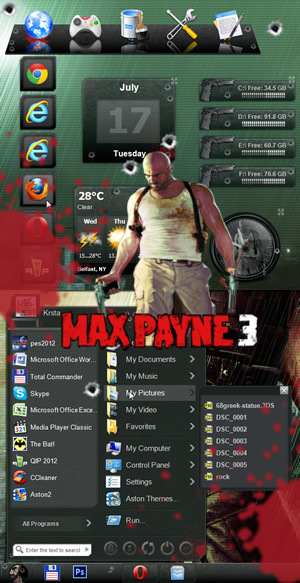 It also lets you get easy access to files, folders and applications on your choice. Aston offers the completely unique approach with yet unseen features and themes with live and 3D animated wallpapers. Every element of Aston: main menu, desktop, panels - can be tweaked and customized, thus letting one create the most convenient working area. Aston makes people surprised about how easy to understand, natural, human and approachable a desktop might be. Aston Menu is a feature-rich Windows start menu replacement with the enhanced functionality. Absolutely all Aston Menu elements are skinnable and can be animated, which makes it yet more attractive. 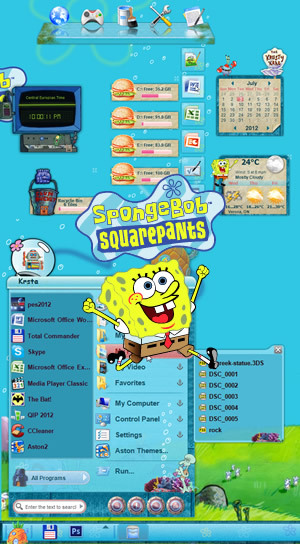 It can be populated with many useful widgets like Clock, Calendar, Recycle bin, Disks, Search, Toplist, Weather and others. Aston Menu provides fast and convenient search for files on local disks and for information in the Internet. Aston Menu can be used both in Aston 1.x shell (staring from 1.9.5 version) and in Explorer shell - there is no need to give up the habitual surroundings in order to use the new menu! Aston Secure Desktop is a security build of Aston branch. It fully supports the features of the newest versions of regular Aston shell. This restricted version is highly recommended to Internet-cafes and kiosks administrators, colleges and companies authorities, and parents willing to find their Desktop settings unaltered after their kids incursions. This is also a perfect way out in other situations when users' ability to customize their working area and time they spend at the computer needs to be limited. AltDesk is skinnable Virtual Desktop Manager for Windows, which has no direct analog among other programs of this kind. It offers you a completely new way of managing running applications on your computer, just as if you had a whole set of monitors. For example, you could launch an Office suite on one Virtual Desktop while working with your e-mail on another. Swapping tasks and switching Desktops can be easily done in the blink of an eye. AltDesk supports skins, which let you choose your preferred appearance and form. It does not require a lot of precious screen space, usually being as small as a window title bar. You can also minimize AltDesk to tray and switch tasks with hotkeys. AltDesk has a user friendly interface, translated into many languages, which makes working with it even more comfortable. StarBlaze is a space shooter game, featuring amazing visual effects and high quality graphics. Crush your enemies in the depths of the space, on the deadly ground, dark ocean waters and even reach the core planet Retulla. Compete with enemy hordes and fight mighty bosses. See the ruins of lost civilizations, the beauty of the underwater and horrible underground tunnels. Collect resources and give your ship more firepower to annihilate the dark forces. Smashing space shooter game is back with new long-awaited sequel. StarBlaze 2 comes with more action, more firepower, more gameplay and more alien annihilating fun. Sequel comes with many improvements. Better graphics, better sound, better special effects quality and better user experience in general. StarBlaze 2 is a classical "shoot 'em up" style arcade game packed with astonishing graphics, breath taking action and incredibly smooth gameplay. Pick up numerous power-ups, tune up your engine, upgrade firepower and blast your way trough 30 levels of this adrenaline-pumping space shooter. Defeat more than 80 enemy types including really nasty bosses and leave a trail of destruction experiencing exotic space locations of unreal beauty. Aston shell and Aston Menu 2.0.4.1 released! Your email address will be kept confidential, and it will be used to send you our free newsletter only.